Hello! Welcome to Taylored Expressions May Spotlight Day! Today is the day that the Baker's Dozen spotlights some of the new products that were released yesterday. Everything is available in the store now! I have a couple of projects to show you today. The first one is a card set that has no stamping. It uses the new Shades of Thanks die (includes the tree and "thanks"). Once again, I kept these cards simple and (relatively) flat, using foam tape only to adhere the main panel to my card base. I overlapped the tree over cream vellum which was die cut using the largest Banner Stacklets 2. I added a pearl to the center of each bird house and a little stitching around the banner and to adhere the word "thanks". 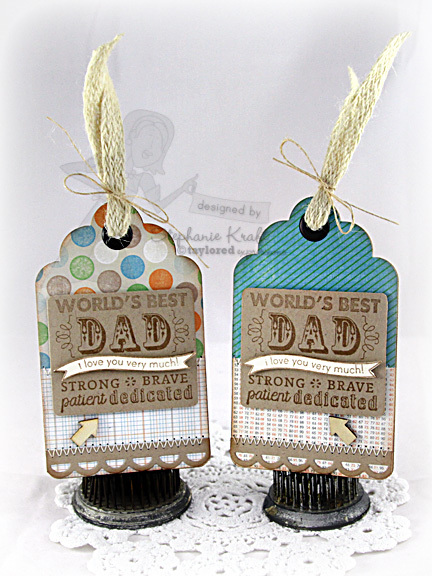 My second project uses the new Graphic Greetings Dad A la Carte stamp set. I cropped a portion of the stamp and made a couple of tags (using the Tag Stacklets 1). I stamped it once on Kraft cardstock and trimmed to my desired size before slightly rounding the corners, then I stamped it a second time on Choice Buttercream, cut out the banner in the middle and popped it on top with foam tape. Accessories: Taylored Dies: Shades of Thanks, Banner Stacklets 2 (Taylored Expressions); Pearls (Kaisercraft), Foam tape, Thread, Sewing machine. Accessories: Taylored Dies: Tag Stacklets 1, Open Scallop Border (Taylored Expressions); Cropadile (WRMK), Arrow wood chips (Freckled Fawn), Brads (WRMK), Burlap ribbon, Burlap twine (May Arts); Foam tape, Thread, Sewing machine. I love the tree silhouette design with the little bit of sewing....it's such a fabulous CAS card and I love the sweet little tags...they are sooo cute!! !